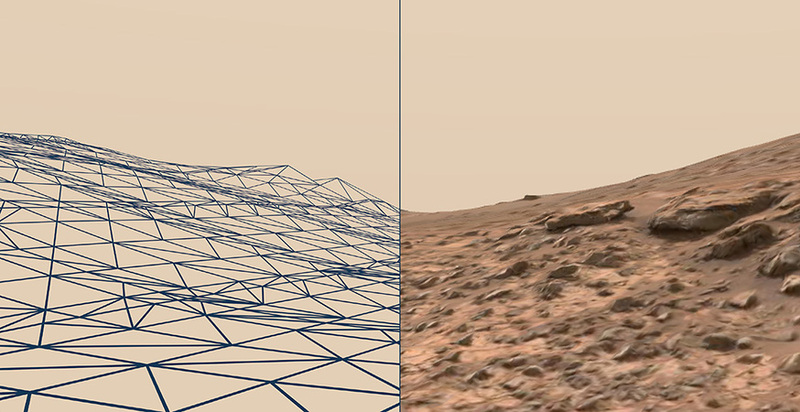 Access Mars lets you explore a 3D replica of the Martian surface, exactly as it was recorded by the Curiosity rover. 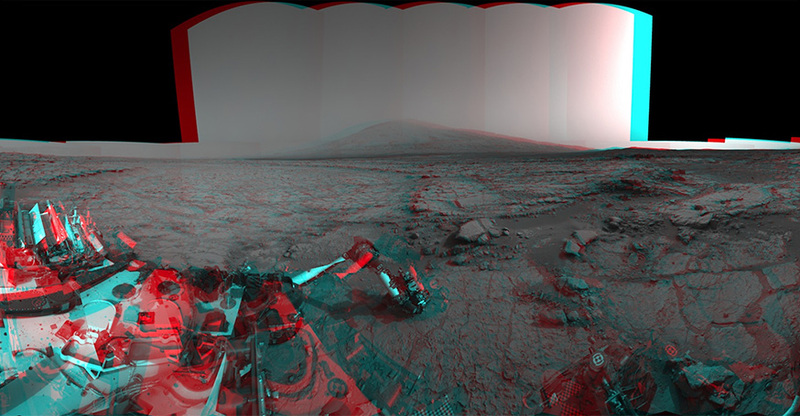 As Curiosity has travelled across Mars, it’s taken digital photographs with two stereoscopic camera systems. By combining and analyzing these photographs, scientists at NASA JPL have created a 3D model used to study Mars and plan future experiments. For the first time, this same 3D model is now available here for anyone to explore in their browser using WebVR. Image mosaics are captured with the left and right Navcam and Mastcam. The two mosaics are then combined together to create a stereo match. Using the data from the stereo match scientists are able to extract 3D mapping data. Using metadata from the time, location, and direction the images were taken, scientists can tile the terrain data into a composite piece of terrain. As you explore the surface of Mars, you’ll learn about key points of interest from Katie Stack Morgan of NASA’s JPL. 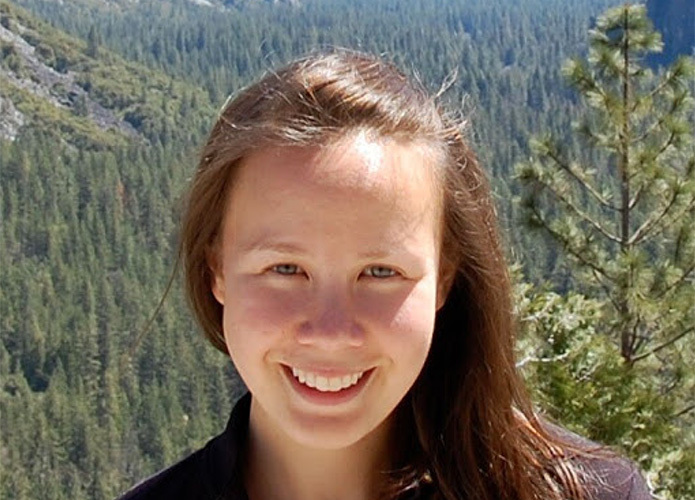 Since 2012, Katie has been working as a planetary geologist on the Mars Science Laboratory mission, analyzing Curiosity’s discoveries and planning future parts of the mission. Her primary focus is studying the geology of ancient Mars to learn what the planet may have been like in the past, and if it might have supported life. Take a look at the code on GitHub. Check out more WebVR Experiments. Get the latest on Mars from NASA. This photo taken from the Mars Reconnaissance Orbiter shows the landing site where you're standing now. It also shows where other parts of the landing system ended up, like the rocket-powered descent stage and the parachute. 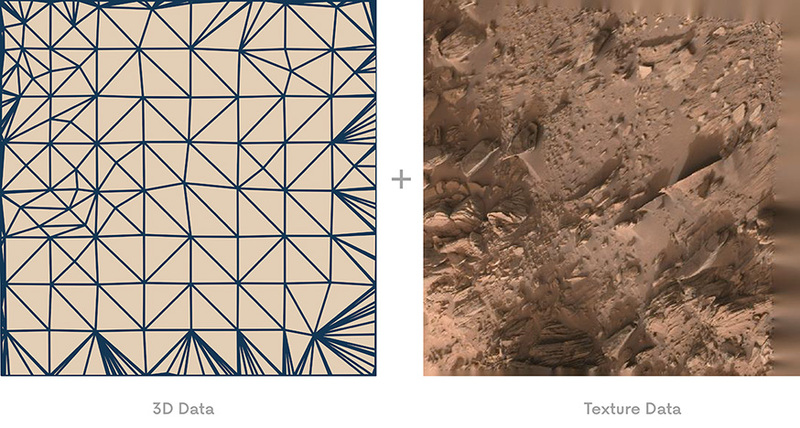 All the terrain around you has been created using real data and images from Curiosity. By taking photos with two side-by-side cameras we can reconstruct the terrain in 3D. Some areas are black and white because they were only photographed by Curiosity's lower resolution navigation cameras. Frequently, Curiosity has to move on before it can photograph everything with its higher resolution Mastcams. These are the Murray Buttes. Buttes are steep, knob-like rock formations. The largest one here is about as tall as a three-story building. These buttes served as Curiosity's entryway to its main destination: Mount Sharp. The Murray Buttes are named after the late Bruce Murray, a Caltech planetary scientist and director of NASA's Jet Propulsion Laboratory. He worked on NASA's first missions to Mars and laid the groundwork for future Mars exploration. These buttes are similar to ones you'd find on Earth, formed when wind erodes ancient sandstone. Scientists have compared the region to Monument Valley. The buttes are beautiful, but are sometimes tall enough to block the signal between Curiosity and the Mars orbiters that fly overhead. That can temporarily reduce the amount of data that Curiosity can send back to Earth. Curiosity arrived in Pahrump Hills in September 2014. It began conducting a walkabout of the area, the same way geologists on Earth do field work. It surveyed the area, then scientists chose which sites to examine more closely. Sedimentary rocks in this area appear to have formed in the presence of water. Scientists think this could have been the bottom of a lake, billions of years ago. Curiosity analyzed several samples in this area using its drill and instruments. Minerals found here suggest that the chemistry of this lake was changing. This suggests that environments on Mars capable of supporting life varied over time. Pahrump Hills is at the base of Mount Sharp, a major objective for Curiosity. From orbit, we have seen layers of minerals reaching from the floor of Gale Crater to the foot hills of Mount Sharp. By climbing up the slope, layer by layer, Curiousity can reveal clues about the history of Mars, and its potential ability to support life. Curiosity arrived in Marias Pass on May 20, 2015. Here, a younger layer of sandstone sits atop an older layer of mudstone, potentially preserving clues about ancient changes in the Martian environment. This target is named "Buckskin." A sample drilled here showed high levels of silica, which could be promising for preserving organic material. It also showed traces of the mineral tridymite, which was left behind by volcanic activity. Curiosity took this selfie here in August 2015. Observations like this are used to monitor dust deposits, wear on the rover's wheels, and other signs of aging. Curiosity spent all of June 2015 parked in this spot, because Mars and Earth were on opposite sides of the Sun. When this 'conjunction' happens, radio signals between Mars and Earth become unreliable, so commands aren't sent to Curiosity. Curiosity's robotic arm contains various instruments to measure rock and soil composition, brush dust away from rocks, take imagery, and even drill into rocks. There are seven different cameras on Curiosity's mast: two pairs of black and white navigation cameras; two color Mastcams; and "ChemCam," which uses a powerful laser to vaporize small pieces of rock from up to 7 meters away. ChemCam captures and analyzes the flash of that vaporization to measure the rock's chemical makeup. Curiosity's two large analytical instruments inside its chassis can analyze rock, soil, and atmosphere samples. These measurements help unlock the history of Mars, revealing that Mars would have been habitable in the ancient past, and also had the basic ingredients for life. At the back of Curiosity is its power source, a Radioisotope Thermoelectric Generator - or RTG - that converts the heat created by a small amount of plutonium into electricity. Curiosity's UHF antenna sends large amounts of data to satellites orbiting Mars, which then send the data to Earth. In a typical day, Curiosity will return around 50 megabytes of data. Curiosity's wheels are twice the size of wheels on previous rovers, helping it handle rougher terrain. 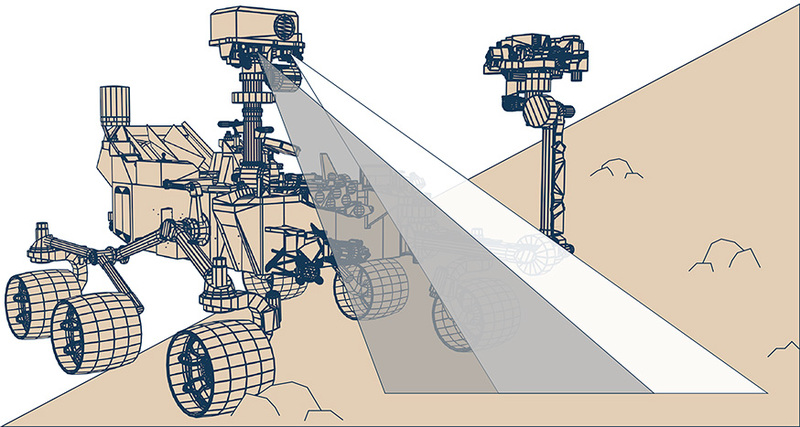 On flat ground, Curiosity has a top speed of four centimeters per second.